Does Lysol kill mold? It goes without saying that nobody enjoys mold. Mold is disgusting in appearance, it carries a poor impression to anyone who sees the mold, and it can be damaging to your health. Most people will make a good effort to ensure that their house or room is clean of any and every form of mold that there is, but there might come a time when you realize that there is more mold than you know what to do with. When this happens, you might not know what you should do next. You might not know whether or not you should get a professional to clean the mold out for you, or if you should just clean up the mess yourself. More often than not, getting the materials to clean up the mold yourself is one of the most cost-effective methods. However, before you can begin cleaning mold out of your house, you will want to first have a good understanding of what mold is. Mold is surprisingly resilient and can grow in a number of different situations. With that being said, one of the key things that mold needs is moisture. Without sufficient moisture, most molds will not be able to grow properly. In addition to moisture, mold needs currents of air to spread the spores from place to place. This is how mold ends up spreading from one place to another fairly quickly. Considering these conditions, it becomes no surprise that one of the most common places that you can find mold is in bathrooms and kitchens. Bathrooms are a prime place for mold to grow, considering there is often at least a few sources of water. The kitchen also provides many places where mold can get its nutrients from. Besides these places, mold will grow on ceilings, plywood, drywall, and even carpet. These are all areas that you are going to have to pay attention to when you are on the hunt for moldy spots in the house. How Do You Get Rid of Mold? There are several ways that you can work through to get rid of mold. Some people will go with the tried and true method of scrubbing the mold away manually with soap and a sponge. However, depending on where the mold is and how much mold is there, this can end up being a project that can span days at a time. There are also methods that involve getting a professional to do the job for you, but these methods are generally expensive and really should only be done if you are incapable of cleaning the mold yourself due to the sheer amount of mold or where the mold is located. For the typical homeowner, one of the best methods that you can use to get rid of relatively minor cases of mold is through using disinfectant. Out of the many brands of disinfectant, Lysol has made a name for itself in its ability to remove mold stains of any kind. 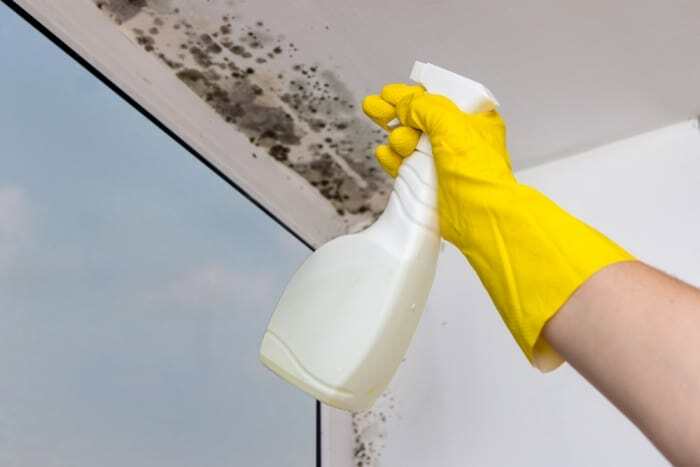 If you are looking for a relatively simple way to get rid of the mold, then going with a few containers of disinfectant is one of the best options for you. The big question is whether or not you are using disinfectant, such as Lysol, really works on removing the mold. The best way to answer this question is to consider whether or not it removes the spores of the mold, rather than just the appearance. As with many other types of plant and fungus, mold uses spores as a way to spread and reproduce more mold. By getting rid of the spores, you can stop the mold from spreading and growing. The truth is, Lysol is a wonderful disinfectant that is designed to rid the area of mold and mildew by removing the spores. This works because Lysol contains a key ingredient in mold removal: bleach. Nearly every commercial mold-removal product has some degree of bleach in it. As long as the mold is not growing on certain surfaces, specifically drywall and wood, you can rest assured knowing that the disinfectant will be removing any sight of the mold and its spores from your house. However, if the object or surface in question is beginning to visibly decay, then chances are that it is too far gone to be saved. This is one of the many reasons why you should make sure that your mold problems do not reach this level. The way that these disinfectants work is by using the key ingredient of bleach. The bleach inside the disinfectant will almost completely eradicate the mold from the area, restoring the place to its original beauty. The earlier you can catch the mold growth, the more effective the disinfectant will be. Now that you know that Lysol is a disinfectant that is well known for its effectiveness in killing mold, you can now begin to learn the proper way to use it to ensure that its potential is maximized, and the risks are minimized. Because this type of disinfectant has bleach in it, there are a few precautions you should take. As you would do with any other material that contained bleach, you should make sure that the room you are using it in is well ventilated. You will also want to do this to minimize the chances that you inhale mold spores, as this will irritate your respiratory system and even get you sick. This reduces the chances that the bleach will irritate your lungs. If you are unable to ventilate the room that you are in properly, you should consider investing in a respirator or a dust mask to wear while you are working. You might also want to wear goggles to keep the bleach from getting in your eyes. You should also wear gloves, especially if you have sensitive skin, so that nothing dries out while you clean the mold from your house. You might also want to make sure that you are wearing clothes that you do not mind getting bleach on, as this reduces much of the risk that comes with handling bleach. Now that you are aware of these issues, you can begin applying Lysol to your house to get rid of any and every speck of mold you can find. The process for this is pretty simple. First, you will want to spray the disinfectant onto the mold growth directly, until it is fully soaked. After waiting about 30 seconds, you will want to find something, such as a towel or sponge, to scrub the area with. Scrubbing the area will remove the mold’s attachment to the surface, quite literally uprooting it. Once this has been done, you will want to rinse that area with some clean water and ensure that it is completely dry. Because mold loves moisture, keeping the area dry will further decrease the chances that the mold will return. By following this process, you can begin taking the steps toward living in a clean, mold-free house again. Why Should You Get Rid of Mold? Mold is not only unsightly, but it can also be damaging to your health. While it can certainly irritate your respiratory system, mold can do a lot worse, especially if you are sensitive or have a delicate respiratory system. Mold spores can enter the body through many different areas, whether that means being inhaled or being absorbed through the skin. Long-term exposure to mold and its spores can lead to developing respiratory issues such as asthma. In addition to this, you will also suffer from skin irritation, runny nose, red eyes, and frequent sneezing. These are just a few of the things that mold can do to you, making it even more important for you to make sure that your house stays as mold-free as possible. Thankfully, there are many ways that you can keep up the prevention of mold in your house. The most effective thing you can do is control the level of moisture in the air of your home. Moisture is one of the key ingredients to a healthy mold colony, meaning that you want to make sure that there is exactly no excess moisture in the house. To achieve this, you might want to install a good ventilation system in the bathroom, or run the fan in the bathroom more often. These will both help to reduce the levels of moisture in the bathroom, which is one of the most common places where mold can grow. If you live in an area that is naturally just warm and humid, you might want to consider getting a device such as a dehumidifier to manually reduce the humidity in your home. Of course, if you choose this option, you will want to read up on the proper way to clean out a dehumidifier. By doing these things and taking extra care to pay attention to the moisture levels in the house, you will be able to create an environment that has no mold. Not only will this make your house look better, but it will also improve the happiness and healthiness of everyone else in the house.